Our skilled teams at Lakewood Ranch Medical Center and Manatee Memorial Hospital specialize in treating chronic wounds with a healing rate of more than 95 percent. Open-heart surgery is traditionally required for patients diagnosed with severe aortic stenosis. But thanks to a minimally invasive alternative, Eugene Vaadi was back to his regular activities just a few weeks after his procedure. Lakewood Ranch Medical Center was recognized by The Joint Commission and the American Heart Association for their comprehensive care for stroke patients. New Year, New Eating Habits, New You! A Q&A with General Surgeon Stelios Rekkas, MD, FASC, and Family Physician Aaron Guthrie, MD on how to develop healthy eating habits for the new year. 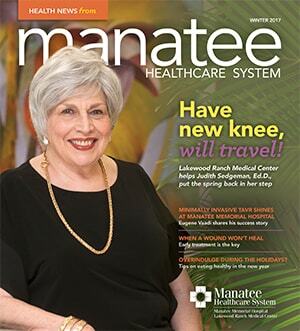 After her total knee replacement surgery at Lakewood, Sedgeman was back on her feet in no time and able to take a trip less than three months later.